Those who know me personally are often entertained by stories of my troublesome little dog. He wears diapers, jumps on counter tops, dumps the trash, opens doors, barks at everything and everyone… and is the biggest love in the world. They also know that I cook for my dog. Since I am often asked about his meals, I thought I would share a simple ‘everyday’ pet food recipe that is healthy, lean and inexpensive. My recipes are rough, so bear with me; just give it a whirl and you’ll see how easy it is. To start with you will need a large casserole pan with a lid. -a pound of ground chicken or turkey. the vet told me to use lean meats, no beef for my breed. -a bag of frozen mixed veggies: carrots, squash, cauliflower, peas, corn, broccoli, beans, almost anything goes. Please read the label and make sure there are NO ONIONS or added salt in the veggies. -3/4 bag or box of uncooked pasta. I usually use omega3 enriched elbow macaroni, but sometimes I just use what is available at home. This dish was prepared with gluten-free rice pasta, which is also a great alternative. -roughly 3 cups of water. Begin by adding a little oil to the bottom of the pan and browning the ground meat. 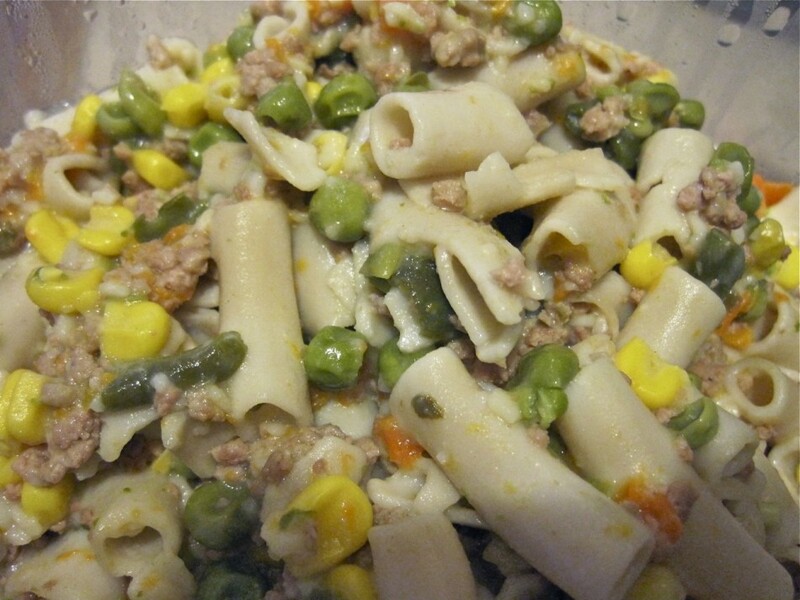 Once brown, add the entire bag of frozen mixed veggies, dried pasta and water. Stir and then cover with lid. Cook for about 10 minutes on high heat, stir. Lower heat to a simmer for another 10 minutes, stirring occasionally, until all the water is absorbed and the pasta is tender. Let stand for 10 or more minutes to cool and then, to break down the pasta and veggies, smash everything together with a hand held potato masher. There are many alternatives to making homemade healthy dog food for your pet, this is just one very simple recipe that works for my household. Of course, frozen veggies can be substituted for fresh, and white rice (not brown, trust me) can be used in lieu of pasta. The most important thing you can do is speak with your Vet about what constitutes a healthy diet and serving size for your breed, then get on the internet, do a little research about foods that are dangerous for dogs (like onions, grapes, garlic and avacado), and go from there. Remember, as with any change in your pet’s diet, do so gradually to avoid stomach upset. Mix a little of the old food with a little of the new food and wean them off. 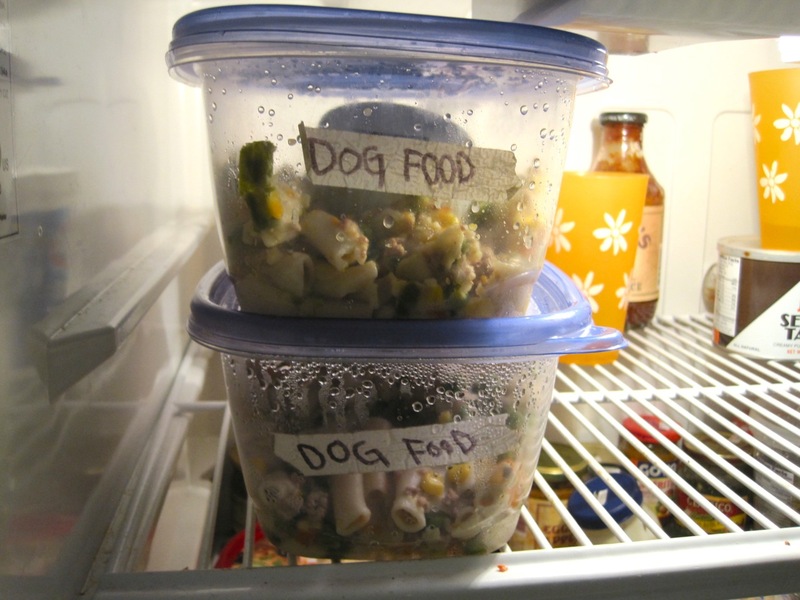 February 18, 2011 | Filed under gluten free, pet and tagged with dog food, gluten free.